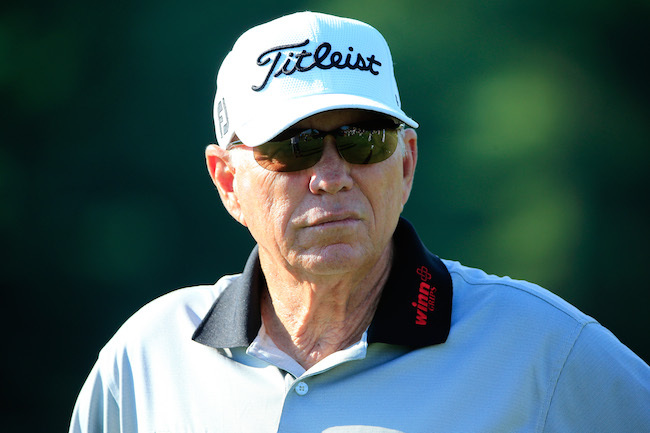 • "I don't think he would ask .. it goes against his pride"
Butch Harmon has revealed he would be willing to help out Tiger Woods as the former world No.1 continues his self-imposed lay-off. But the 71-year-old, who coached Woods between 1996 and 2002, said in an interview with GolfWorld’s Tim Rosaforte, that such a call from Woods would dent his pride. Woods hasn’t featured on the PGA Tour since withdrawing from the Farmers Insurance Open during the first round citing back pain, which came a week after a career-worst round of 82 at the Waste Management Phoenix Open. Commentating for Sky Sports on the day of his withdrawal, Butch Harmon, who was with Woods for seven of his 14 major titles, said: “It’s getting harder and harder to watch him. For the greatest player of our generation he is struggling in many ways; struggling with his health, struggling with his golf swing, struggling with his short game and as a fan of golf, it’s hard to watch. Woods subsequently released a statement on his website confirming his break, saying his play was “not acceptable for tournament golf”, but had targeted a return at this week’s Honda Classic in Florida. But that always seemed premature and, sure enough, he announced last Thursday that he would not be competing in the tournament. The race is now on for Woods – who has fallen to No.70 in the world rankings and will therefore be ineligible for the WGC-Cadillac Championship from March 5-8 – to be ‘tournament ready’ by the time the Masters comes around in April. As time winds down towards the Masters with Woods not hinting at a return, should he give Butch Harmon a call? Leave your thoughts in the ‘Comments’ section below.